We as adults need to model better “weighing and considering” & curiosity & passion. Intelligence will not save us, but critical thinking sure might. Jenn – Thanks for sharing Jose’s insights here, love his perspectives on aggressive questioning (a la Socrates!) and bringing an open mind. Maybe he’ll weigh in here as well. Agree ‘discernment’ is a great concept. Also can tee up as ‘challenging the status quo’ and ‘looking beneath the surface’. Some good metaphors to tap. In fact, we’ll be exploring metaphor in the next post, as an extension of this one. As always, appreciate your thoughts & feedback. great post and i must applaud you on your own command of the written language and semantics. Your argument is clear and the meaning to anyone whose role it is to communicate with others professionally is, in your own words, subtle, but powerful. I have explored this subject from another direction using cognitive psychology, specifically the murky depths of the adaptive unconscious, and agree with your may points. One of the most important tasks we as communicators need to focus on is our own awareness of our language; not just the words we use, but how we use them. As large organizations seek to employ more and more people from the enterprise to engage socially with customers, partners and internally to the organization, there is a growing risk of being misunderstood en masse. Thanks for such a great piece of critical writing. A joy to read. Super feedback, Jeff, so glad the post resonated with you. Would love to delve more into the cognitive dimension. Have nibbled around the fringes but have not yet done a deep dive. I do have plans to look into mental heuristics, if that’s an area of interest? Great post on a big topic close to my heart! There are so many aspects to the impact of language, on relationships, productivity, leadership, mental models… My background is in communications and leadership and my major project for my MA in Leadership is looking into leadership in internal social networks, which has led me in many different/new directions to explore the impact of language, especially when it stands alone (online), and how language shapes offline relationships and motivation. An intriguing point of view, or perhaps philosophy, that relates to your thoughts (and Wittgenstein’s) of language being central to critical thinking, and the benefits of having mastery of it, is the role of language and dialogue as not just an act, but an outcome; that it’s not just about what it says, but what it does. Bolman & Deal talk about this in Reframing Organizations as the symbolic frame (the importance of using symbols to create meaning). Deming focuses on the use of stories to create meaning, memory and action. And there’s a breadth of literature on the use of metaphors (I’m including a link here on work being done to explore how metaphors vary across cultures – fascinating – http://bit.ly/rs8O97). Often we don’t remember exactly what was said, but if it resonated, we remember the feeling we had, and the core of the message, and associations we (or the person we heard it from) create to return to it. While language can bound our possibilities, when we break out of the paradigm of language as words and grammar, to language as images, connectors, action, outcome – I think then we see its impact as the master key to possibilities. It does take openness and acquired skill to using it in different ways, for different purposes, for different people – but as you point out, that’s the critical thinking part :) and I also think it’s the people part, in recognizing we are all different, and listen/hear in different ways. Framing Knowledge (“KM”) vs. Ideas. I like the many communication extensions you mentioned – symbols, stories, metaphors, associations, connectors, images, outcomes – so many ways to shape our perceptions of things, whether via simple messages from an individual, or importantly, as a means to frame ideas themselves. When accumulated, it represents knowledge, but there, things start getting heavy and abstract. There’s the whole practice of Knowledge Management (“KM”) to consider, but that is often not accessible to people, even us so called knowledge workers. Collaboration. So when talking about knowledge I will often switch to talking about the exchange, creation and/or expansion of ideas. Too most, knowledge is off in the mind of some scientist (tacit) or on a wikipedia page (explicit). What I have in my own simple, working class mind are more readily framed as ideas. 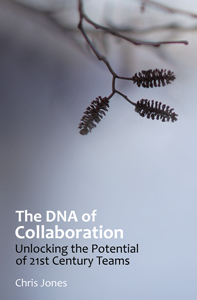 Senge said KM and collaboration are really two sides of the same coin, and that you really can’t separate the two. I think he’s spot on. And when semantics falls over? The Problem with “Social” Media. A good example of semantics gone wrong from a prior post (link) is ‘Social Media’ itself, a name that for many in commercial and government sectors brings to mind parties and Facebook; time and again, this creates a mental block for c-level executives that hinders broader commercial adoption of useful technology. Love the cross-pollination going on here. Learning at every turn. Thanks again for the insights – keep them coming. I’m sensing many great conversations ahead. Let’s stay in touch, and I’m with you: let’s keep posting! Yes, many interesting conversations to follow! I shall reply to your post shortly . . .
Chris, Folks might find it helpful to take the frame one step up from semantics towards the semiotic language. Helps capture a fuller articulation of “communication”. It allows one to see human communication is merely one aspect of a much larger and sometimes helpful way to look at it. Helps makes sense of what the scientists are pointing at with “Everything is Information.” string of words. Semiotics is frequently seen as having important anthropological dimensions; for example, Umberto Eco proposes that every cultural phenomenon can be studied as communication. However, some semioticians focus on the logical dimensions of the science. They examine areas belonging also to the natural sciences – such as how organisms make predictions about, and adapt to, their semiotic niche in the world (see semiosis). In general, semiotic theories take signs or sign systems as their object of study: the communication of information in living organisms is covered in biosemiotics or zoosemiosis. I’ve never heard a C-Suite person suggest the modifier “social” is what keeps them from embracing social media. Instead they almost universally refer to the content of those conversations as being personal, irrelevant, or inane. It’s the party messages they reject. Yes, Jeffrey, each exec will react in their own way, based on their perceptions, education, and cultural orientation. Early in any tech adoption curve, as folks try to learn how to use a tool, there will be some trial and error. Logic might predict tools that can be used in the public domain for chit chat (eg., Facebook and Twitter) might serve similar purposes inside the firewall. I’ve seen those conclusions drawn, and I’ve seen those behaviors ensue. No harm, no foul. But early adopters may not see the full picture. It takes time, experience, and some critical thought to challenge the default thinking and to introduce an alternate use case – one that might prove to be very useful in other ways. But that’s another thread. Moral of the story: semantics can trigger counter-productive mindsets. All that said, I’ve personally been in senior level debates based solely on semantics, not content. So consider yourself lucky, you’ve been spared!